1. Free Cell Phone Lot - short-term parking area for passenger pick-up. Wait for passengers to call, then pick up at curbside baggage claim. No commercial or unattended vehicles. Payment Options: (except for Valet Parking): American Express, MasterCard, Visa, E-PASS, SunPass. From the North (SR 436/SR 528): The Cell Phone Parking Lot is located on the South Approach Road, about 1 mile south of the terminal building. Exit right from the North Entrance road onto the South Exit Road. Turn left off the South Exit Road into the Cell Phone Lot where indicated. From the South (SR 417): The Cell Phone Parking Lot is located on the South Approach Road, about 1 mile south of the terminal building. Exit SR 417 at Boggy Creek Road. Go north on Boggy Creek Road and branch left onto the South Approach Road. Turn right off the South Entrance Road into the Cell Phone Lot where indicated. 2. Red & Blue Satelline Lots - You may park in the Satellite Parking lot for any length of time up to 120 days. Free shuttle service every 10 mins between the Satellite Parking lots and main terminal. Departing passengers are dropped off on the Departures Level (Level 3) on both the A and B sides of the main terminal. Allow yourself an add'l 30 mins when using Satellite Parking. 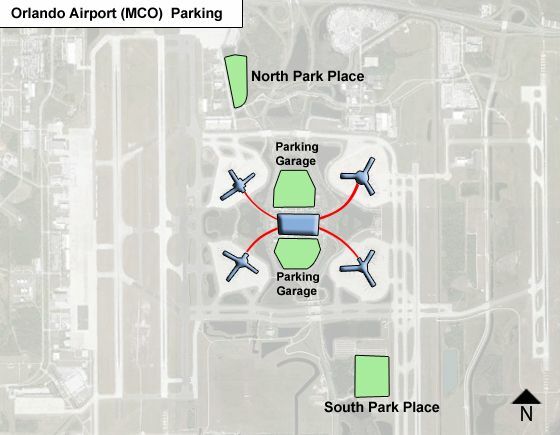 Satellite parking is uncovered, but is in fenced facilities which are routinely patrolled by the Orlando Police Department - Airport Division. From the North (SR 436/SR 528): The Blue Satellite Parking Lot is located on Cargo Road, just off the North Entrance road from Semoran Boulevard (SR 436), about 1 mile north of the terminal building. Exit right from the North Entrance road onto the Cargo Road exit ramp. At the lights at the junction of the exit ramp and Cargo Road, go straight over into the Blue Satellite Parking Lot. To return to the Blue Satellite Parking lot, board the free shuttle service which operates regularly, as per the posted schedule from commercial lane parking space A17-A18 (on the A side), and B18-B19 (on the B side) on the Ground Transportation Level (Level 1) of the main terminal (one level below Baggage Claim/Arrivals). From the South (SR 417): The Red Satellite Parking Lot is located on the South Approach Road, about 1 mile south of the terminal building. Exit SR 417 at Boggy Creek Road. Go north on Boggy Creek Road and branch left onto the South Approach Road. Turn right off the South Entrance Road into the Red Lot where indicated. To return to the Red Satellite Parking lot, board the free shuttle service, see posted schedule from commercial lane parking space A17-A18 (on the A side), and B18-B19 (on the B side) on the Ground Transportation Level (Level 1) of the main terminal (one level below Baggage Claim/Arrivals). An additional (Gold) satellite parking lot may be used when the Blue and Red Lots reach capacity. The Gold Satellite Parking Lot is located 2 miles west of the Blue Lot on Tradeport Drive. Please follow road signs to whichever satellite parking lots are open. Oversized vehicles: Vehicles longer than 20 feet in length cannot be accommodated in the satellite parking lots. 3. Terminal Garage Parking is located on either side of the Main Terminal ("A" and "B" side garages). Your airline will determine which side you should use. Terminal B is served by: US Airways, Spirit, Northwest, United/Ted Aer Lingus, British Airways, Lufthansa, Pace, Miami Air, AirTran, Delta, AeroMexico and Condor. If none of these are yours, you must choose Terminal A. Follow signs to Terminal Garage Parking on the entrance roads. The Terminal Garage consists of 10 Parking Levels: Levels 1-4 = A&B side; Levels 5-10 and part of Level 4 is Terminal Top; R2 and R1 Level are for Car Rentals. After parking, take the elevator down to the Tunnel Level, cross to the Main Terminal, then take the elevator/escalator up to the Arrivals Level (Level 2), or Departures Level (Level 3). Terminal Top Parking may be accessed from the top level of the "A" or "B" side Terminal Garage Parking. After parking, you may take the elevator down inside the Main Terminal on either the "A" or "B" side. 4. Valet Parking - at the Hyatt Regency Orlando International Airport. Car detailing is also available. 5. Express Pick-Up/Drop-Off - open from 8:00am to midnight daily. You may either remain in your car, or exit car to pick-up/drop-off passengers. Follow signs to Express Pick-up area at the departing flight curb. Vehicles may NOT be left overnight. 6. Hotel Parking for guests at the Hyatt Regency Orlando International Airport - Fees are per night and are charged directly to your room. The Hyatt also offers Hotel Packages that include parking for the duration of your trip. (c) Satellite Parking Lots - on the shuttle service to/from terminal. To ensure availability call (407) 825-2980 for advance arrangements. 8. Oversized Vehicles - Parking for oversized vehicles: next to the "B" side Terminal Garage Parking. Enter the "B" side Terminal Garage Parking entry plaza and follow signs to the left into the surface parking lot. Oversized vehicles include vehicles higher than 7' 0" and/or longer than 20 feet in length. 9. Curbside Drop-Off - You may drop domestic passengers off at the curbside check-in on the Departures Level (Level 3) on either the "A" or "B" side of the Main Terminal. If you wish to park after dropping off passengers and luggage, follow signs to either Satellite Parking or use the "Quick Park" ramp on the "A" or "B" sides of the Main Terminal to access the Terminal Garage Parking. Vehicles cannot park there unless actively unloading passengers and/or baggage, and under no circumstances may vehicles be left unattended. (a) ENTER � Enter the parking garages using the specially marked �E-PASS/SunPass' lanes. No parking ticket required. (c) PAY � Use the specially marked �E-PASS/SunPass� lanes for exit. Parking fees are deducted from your E-PASS/SunPass account. No additional fees. For receipts contact your EPass or SunPass office. If you presently don�t have E-PASS/SunPass and would like it in the future, contact: 407-823-7277 or 888-865-5352. For further information on parking call (407) 825-PARK. Cell phone lot for Jet Blue arrivals terminal? Where does Jet Blue arrive?